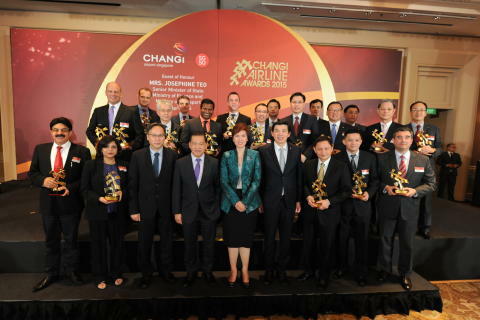 SINGAPORE, 23 April 2015 – Changi Airport Group (CAG) honoured its top airline partners this evening at the Changi Airline Awards 2015, where a total of 23 awards were presented to airlines whose efforts have contributed to the growth and development of the Singapore air hub. Themed SG50, the awards ceremony, into its 10th year, also featured the pioneer airlines that have been operating in Singapore since the country’s independence, and showcased their contributions to Singapore aviation. At the event graced by Mrs Josephine Teo, Senior Minister of State for Finance and Transport, awards across six categories were presented. 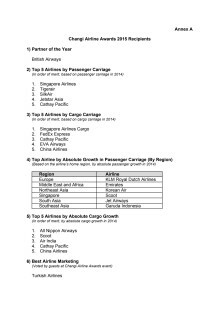 These included top airlines by passenger and cargo carriage, top airlines by absolute growth in passenger carriage by region, top airlines by absolute cargo growth, best airline marketing and the Partner of the Year award. A list of all the award winners is in Annex A. The Partner of the Year award was presented to British Airways, for its steadfast and unwavering commitment to grow and develop the Singapore air hub. Singapore remains a key stopover destination in the airline’s network, linking Europe with Australia and Southeast Asia. 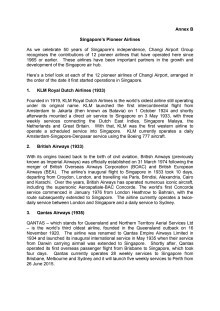 Over the years, the London-Singapore route has witnessed a number of groundbreaking aviation developments, including iconic aircraft such as the revolutionary Imperial Airways C Class flying boat and the supersonic Concorde that plied the route. Today, British Airways is the largest European carrier serving Changi Airport, with close to 470,000 passenger movements registered in 2014. The airline operates twice-daily services between London and Singapore, with one of the services extending to Sydney, Australia. In October 2014, British Airways increased capacity on the London-Singapore route, with the launch of thrice-weekly A380 services, giving customers more options to the United Kingdom, Europe and North America. Singapore was the fifth destination in the airline’s network selected for the super jumbo’s operations. This connection is set to grow, with British Airways increasing its A380 service between London and Singapore to daily flights from December 2015. This will boost the airline’s total weekly seat capacity on the route by 15%. In addition, the airline will also unveil a refurbished lounge at Changi Airport later this year, enhancing its on-ground service to passengers. In terms of passenger carriage, the top five airlines operating at Changi Airport in 2014 were Singapore Airlines, Tigerair, SilkAir, Jetstar Asia and, for the first time, Cathay Pacific. On the cargo front, the cargo airlines in the top five spots were largely unchanged, with Singapore Airlines Cargo continuing to head the list. Airlines that registered the strongest absolute growth in passenger traffic (by region of origin) were also lauded for their contributions. These were Scoot (Singapore), Garuda Indonesia (Southeast Asia), Korean Air (Northeast Asia), Jet Airways (South Asia), Emirates (Middle East) and KLM Royal Dutch Airlines (Europe). Emirates and Jet Airways were repeat winners in their respective categories, winning the award for the third and fourth year in a row respectively. Marking Singapore’s Golden Jubilee at the event, CAG paid tribute to Mr Lee Kuan Yew, the pioneer of Singapore aviation, who was instrumental in the conception and development of Changi Airport. Not only had Mr Lee’s foresight to shift the airport from Paya Lebar to Changi kick-started Changi Airport’s development, his conviction that all aviation partners have to work together for the Singapore air hub to succeed, is one that has underpinned Changi’s growth all these years. In recognition of the contributions of Singapore’s first batch of airlines, a special SG50 pioneer airlines exhibition was set up as part of the Changi Airline Awards event. The exhibition commemorated the history and showcased the achievements of the 12 pioneer airlines – Air France, Air India, British Airways, Cathay Pacific, Japan Airlines, KLM Royal Dutch Airlines, Lufthansa, Malaysia Airlines, Philippine Airlines, Qantas, Singapore Airlines and Thai Airways. Having operated here since the country’s independence or earlier, these airlines have come a long way with the Singapore air hub, contributing to its growth over the past fifty years. 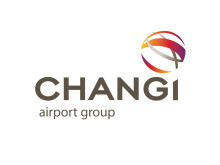 Today, Changi Airport continues to thrive thanks to its network of close knit partnerships between airlines and airport partners – to improve connectivity, grow traffic, enhance service standards and support each other in times of need. For instance, Changi’s strong portfolio of airlines has created a conducive eco-system for codeshare partnerships to flourish as airlines expand their networks, allowing the Singapore air hub to better serve passengers. Similarly, the airport community came together last year when crisis hit with the QZ8501 incident, with airlines providing their unwavering support to the relatives of passengers onboard. The Partner of the Year award, launched in 2010, gives special recognition to a key partner that has worked closely with Changi Airport Group and made a substantial contribution to the growth and development of the Singapore air hub.